This bold, kukri-like survival machete is manufactured by BTI Tools, a company that produces Schrade products as well as Old Timer, Uncle Henry, and Imperial branded products. They are probably best known for their pocket knives, but feature a wide selection of products ranging from fixed and folding knives, collapsible batons, tactical pens to tactical and survival accessories and flashlights that are used by survival/outdoor enthusiasts, law enforcement, and even fire department personnel. Schrade knives were manufactured by Taylor Brands until 2016, but Smith & Wesson acquired Taylor Brands and incorporated it into BTI Tools. The Schrade SCHF48 is a sturdy fixed blade knife with a massive blade. It has an overall length (handle + blade) of 17.50″ and features a drop point blade with partial hollow grind that has a length of 11.625″ and blade thickness of 0.19″. While at first glance that that may seem a tad on the large size for a survival knife, it’s actually well balanced and not so big as to become unwieldy in the field. The Jethro is a perfectly controllable strong chopper weighing in a 1 lb 11.00 oz. If you’re a fan of the outdoor experience and a person that loves tough, overbuilt gear and knows how to handle a survival knife in the wilderness, this versatile fixed-blade will be right up your alley. While chopping is what it does best, you’ll discover that the Jethro’s robust hollow ground blade can also be used for detail work while maintaining its ability to easily split large pieces of wood. Its sturdiness, sharpness, balance, and comfortable grip makes it a good companion for any hunter or camper as well. It satisfies the hard-core wood chopper by providing a strong and wide blade that has no problem going through thick chunks of wood and it also offers a little something for those that look more in the details of tactical cutlery such as the ergonomics of the handle and the comfortable grip. The Schrade Jethro has a drop-point blade shape with slight recurve and angled handle that gives it kukri-like performance while chopping. Unlike an actual kukri knife, the angle of the Jethro’s blade changes after the handle. The blade is made of 3Cr13 titanium coated stainless steel. For a cheap Chinese steel I found 3Cr13 to be fairly tough and easy to sharpen with decent edge retention, all properties comparable to 420J2. Not a premium steel by any means, but what do you really expect for $50? The 0.19″ thick blade has a hallow grind and offers plenty of cutting edge, having a wider belly than other choppers in its class, thus allowing to use any portion of the belly for whatever tasks you need completed in the bush. The full-tang spine gives the knife a good structural strength that makes for a better leverage. The inner curve of the blade can be used for pulling cuts that allow you to more accurately shave small pieces of wood by pulling them across the blade. Perfect for making fire starter material. Due to the inner curve, the pulling cuts technique can be done free-hand if you don’t have something to stab your knife into. The rubberized 5.875″ handle of the Schrade SCHF48 is made of TPE (short for Thermoplastic Elastomer). The TPE handle absorbs shock and vibrations pretty well and allows a sturdy grip when aggressively piercing and stabbing. The handle slab is patterned to provide extra control for the grip and prevent discomfort from hot spots. The handle scales also include ergonomic finger grooves and end flairs out, resulting in a positive grip. A large finger choil located at the base of the blade, before meeting the handle insures good balance and control when choking up for finer work and more detailed cutting. The handle is equipped with a spine slope and very sharp, aggressive jimping for thumb placement. You will also find front and rear lanyard holes for an additional level of security. This is an important feature for a massive knife like this one and it is advisable to take advantage of the loops and use a lanyard. The Schrade Jethro being reviewed comes with a nylon fiber sheath (basically hard plastic, similar to Kydex) that offers a solid retention. The carry options for the strong plastic sheath are a non-adjustable belt loop and a detachable shoulder strap, so you can choose however you want to wear your blade. The sheath has grommet holes all around the edge for different latching options and it also features a velcro strap around the handle to ensure the blade is safely secured. The blade slides in with a satisfying click and the sheath holds it securely once the velco strap is fastened. Overall it’s not bad for a stock sheath. Not amazing, but better than most sheaths provided with knives in this low price range. The Schrade Jethro is a big knife that is clearly designed as a chopper and batoning blade, although it can still be a very useful tool for carving and finer detail work if necessary. The overall features of this knife makes it a good investment for those who want a large, tough survival machete at a lower price than can be found on the market for similar quality products. Outdoor enthusiasts will discover a fixed blade knife that has the strength and ability to do any wood work. The Schrade SCHF48 is a very strong chopper that can baton large pieces of wood or carve and slice with fine detail. It has a thick full-tang blade that lives up to a proper survival knife. The steel choice (3Cr13) isn’t ideal, but gets the job done for an economical price point. Its ergonomic TPE handle has a secure, comfortable grip and its balance makes it a top contender among its quality class. Another plus of this knife is that its features such as lanyard holes on the handle/blade and forward finger choil improve by miles the experience one has while wielding the knife. Due to its properties, you can rely on this kukri-like machete to do any job you need while on a survival adventure, a hike or just working in your backyard. Its price allows you to acquire a competitive product that can be a useful tool whether you want to process wood and are preparing yourself for a lot of batoning and chopping or you need to use it to carve wood for tasks such as tool building or creating feather sticks to light up a fire. The only suggestion for improvement that I can think of for the Schrade Jethro involves the area between the forward choil and where the cutting edge starts there is a distance of over an inch. For those who want to obtain fine details while carving, it would have been useful to have a sharpened blade right up to the finger choil. Some owners of the Jethro have suggested that the jimping is too sharp and unneeded, but this will come down to personal preference. I had no issues with the jimping and while it does provide some additional traction, the large choil and finger grooves really do most of the work of keeping your hand from slipping. For the price it’s a great knife. Love the blade shape and the angle of the handle really helps generate extra power. I did find the jimping uncomfortable so I sanded it down some. Not much, just enough to round it off a little and get rid of the “bite”. If it were made of a better steel it might make a decent successor to the now-discontinued Becker BK4 Machaxe that it resembles. As for the 3cr13 steel for $50, the BK4 retailed for about $30 more when it was available and it was made in the U.S. of 1095 Cro-Van steel. I got mine for about $55 when it was discontinued and I’m glad I did because IMO this obviously Machaxe-inspired Schrade knife is overpriced for what you get and where it’s made. Even the Jessica-X is made of a more appropriate steel (though not the correct blade grind) for a knife like this and around the same price as this. 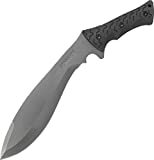 Even with the BK4 gone now, there are still better options for a kukri-style blade in this price range. Ontario and Ka-Bar make a few, also out of 1095 and 1095 Cro-van and made in the U.S. Whatever. A slight correction: the regular Ka-bar kukri machete is made in Taiwan of 1085–still better than 3cr13 and around the same price as the Jethro. The Ka-bar combat kukri is made in the U.s. of 1095 cro-van and about $20 more. The Ontario Kukri is made in the U.S. of regular 1095.